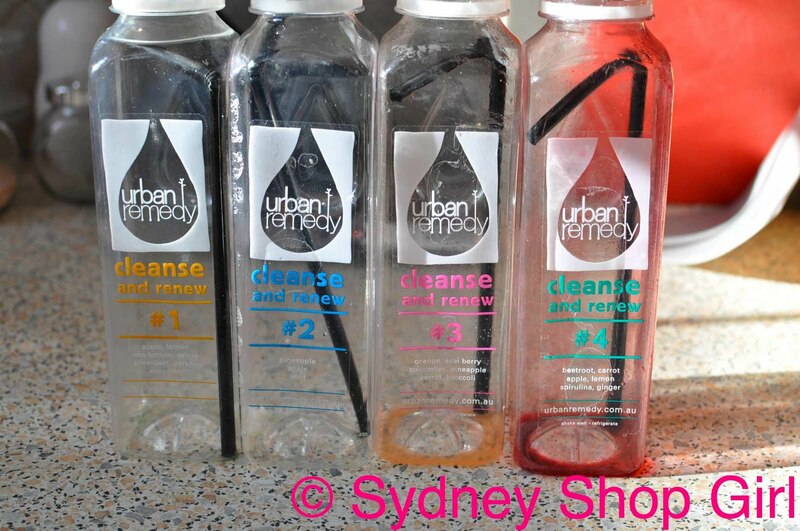 Sydney Shop Girl: The Pineapple at the End of My Fruit and Vegetable Juice Rainbow. The Pineapple at the End of My Fruit and Vegetable Juice Rainbow. 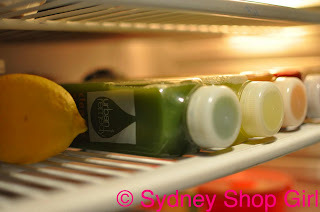 Dawn broke in the SSG Manor fridge to reveal 6 bottled juices in all the colours of the rainbow and a lemon. The time to detox had come. 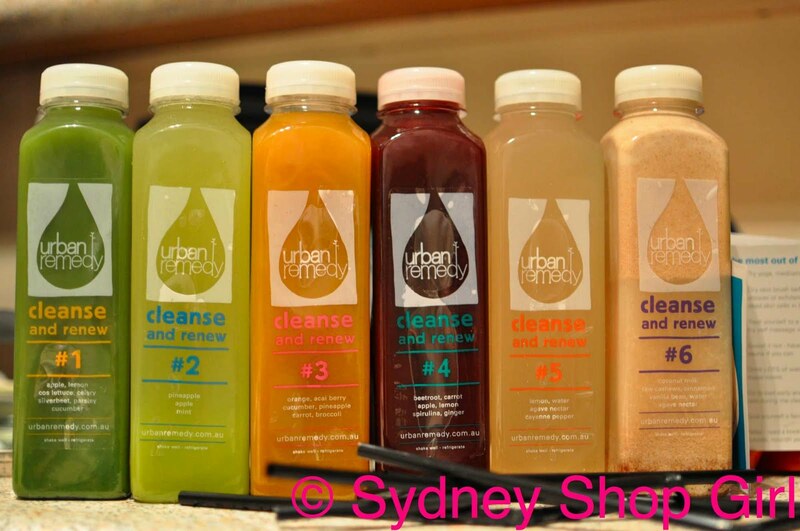 Would there be a pot of gold at the end of my detoxing rainbow? I started the day with a glass of boiling water with a twist of lemon juice, went for a run and then tackled the juices. 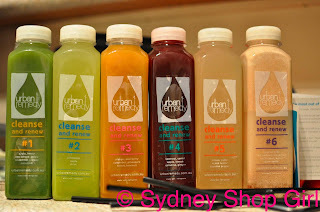 The suggested cleanse is to drink one bottle of juice every 2 hours starting with 1 and going on to 6. They should be spaced out by at least an hour and also drunk slowly (which is going to be easier with some but harder with the more difficult tasting juices). A tall glass of water is recommended between each juice. There are a few 'cheats tips' to help you get through the day. Cucumber and celery sticks, miso soup and herbal teas are allowed. A suggested list of activities to keep you going through the day were also included. I noted that 'going to work' wasn't an option on the activities list. Juice 1 was very heavy going for me, even with a side serve of camomile tea. Apple, celery, cucumber, silverbeet, lemon, cos lettuce and parsley. Unfortunately, the only flavour I couldn't taste was apple. Mr SSG was trying hard to be supportive with a breakfast of toasted cheese sandwiches, curry puffs and several cups of Irish Breakfast tea. I liked Juice 2 - apple, pineapple and mint. None of the juices are particularly 'sweet' and Juice 3 is the closest to a normal fruit juice of the series. Buoyed by my enjoyment of the juice, I went out for a couple of hours to fill in the time before my next liquid meal. I got my first 'real' pedicure. The ladies at the store took pity on my short fingernails and tidied them up for me too. I could get used to this. 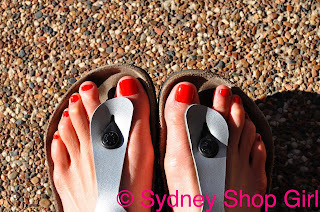 OPI's Red Gift, silver Birkenstock Gizeh's. For the OPI fans - the shade is Red Gift. To go with my journal, suitcase and backpack - naturally. Then I wondered off to the beautician. I covered the whole list of suggested relaxing activities. It was still only lunch time. I walked home. 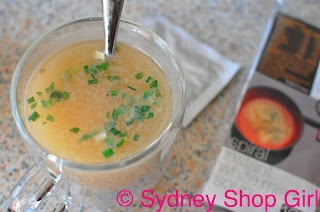 Not bad for packet miso soup! The things you find in the Coles organic food section. I survived Juice 3 - orange, acai berry, cucumber, pineapple, carrot and brocoli. By this stage is was just after 2pm. I had a dull ache in my head and felt incredibly cold. The room was well heated and I was wrapped in a few layers of fleece and blankets but I still couldn't seem to get warm. I had an afternoon nap for an hour or so, very unusual for me. I was also strangely apathetic towards the world in general. I'm usually running around getting things done and to be like this on the First Monday Of Annual Leave was cause for concern. Empties to add some nutritional value to the SSG Manor plastics and glass recycling bin. Not surprisingly the writing was on the wall for my detox career and then I hit that metarphorical brick wall with Juice 4 - beetroot, carrot, spirulina, apple, lemon and ginger. The lack of solid food had me watching the clock for my next juice. I could see that if I didn't start eat sensibly I'd start making illogical choices very very soon. So, 15 hours and 18 minutes into my first detox, I gave in. The most anticipated and appreciated cup of tea of 2010. 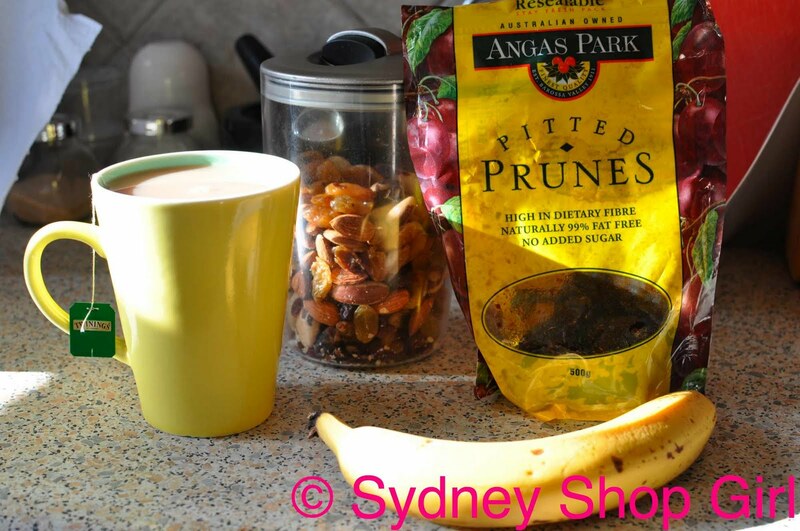 The things I craved were dried fruit, a banana and a cup of tea. My usual snacks. The headache is going away now as I sip my tea and have a snack. I'm more alert and able to blog! to focus on what foods I really want to eat rather than eating things out of habit. Within the limits of my participation today, I achieved all the goals I set out to achieve. I now know that I'm a person who needs nutritious whole foods (and caffeine) and that the all liquid alternative just isn't for me. I am conscious of the foods I need in my day and am relieved that I was eating most of them anway, pre detox attempt. It's just the comfort foods I need to keep a check on and I have realistic ways of dealing with this by making wiser choices when it comes to snacks. Urban Remedy provide great customer service and support - I cannot fault them. I'm just the wrong food loving girl for the product. The one day program, even up to Juice 4 definitely helps with 'elimination'. I'll just leave it there. I have 2 juices left and I'll be having them tomorrow before I get on the plane. I have a new Foxtel obsession - Pineapple Dance Studio. It's a hilarious fly on the wall type documentary about the famous UK dance studio. This is Louis Spence - the head choreographer. He's wearing a t-shirt in OPI Red Gift. To match my manicure which matches everything else I've already mentioned. My day has been a fruit themed rainbow - fruit juices, dried fruit, bananas and pineapples. The pot of gold at the end of it wasn't quite what I had anticipated but it was a memorable journey from which I've learned a little more about myself. You should of tweeted me for some support. I would of helped you through it. The best feeling is waking up the next morning. Seeing all the juices has made me want them again. Oddly, i didn't enjoy them, but i've been craving them. I tried the 3 day detox a few months ago. I love food far too much too....and dont particularly like juice. I would rather eat no processed food for a few days. And I think I would end up feeling better. How long was the detox intended to last for? I did the Lemon Detox in December 2008. Elimination for sure. Ummm.